MONTREAL, June 18, 2018 /CNW Telbec/ - SRG Graphite Inc. (TSXV: SRG) ("SRG" or the "Company") is pleased to report an updated mineral resource estimate for its 100%-owned Lola graphite deposit located in the Republic of Guinea (the "2018 Mineral Resource Estimate"). The 2018 Mineral Resource Estimate represents an increase of 54% of In-situ Graphitic Carbon ('Cg') at a 3% cut-off grade since the publication of the maiden resource. In preparation for the next phase of development of the project, several boreholes were completed to increase measured and indicated resources from inferred resources. As such, measured and indicated resources increased from 224,118t to 676,900t of Cg content at a 3% cut-off-grade, an increase of 201%. The 2018 Mineral Resource Estimate, prepared by Montreal-based Met-Chem, a division of DRA Americas Inc. ("Met-Chem/DRA"), includes a pit-constrained measured and indicated resource of 12.2 million tonnes ("Mt") grading 5.6% graphitic carbon Cg and an inferred resource of 2.1 Mt grading 6.1% Cg, using a cut-off grade of 3.0% Cg. Effective date of the estimate is June 14, 2018. 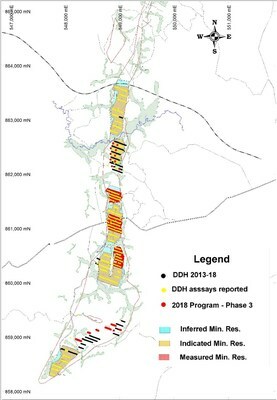 The 2018 Mineral Resource Estimate replaces the maiden mineral resource estimate which was reported by SRG on December 22, 2017, and subsequently included in a Technical Report completed by Met-Chem/DRA with an effective date of September 30, 2017. A NI 43-101 Technical Report will be filed on SEDAR within 45 days of this news release providing the details of this resource update. Figure 1 provides a map of the current drilling program. Completed boreholes, assay results pending and boreholes to be completed can be viewed on the map. The mineral resources are based on 395 boreholes for 12,086 meters ("m") drilled up to April 4, 2018. Since that time, an additional 162 diamond drill holes have been completed, for approximately 5,686 additional meters for a total of 17,954 meters. Assay results for these additional holes are pending. Drilling onsite is ongoing and an additional 3,000 meters of drilling are scheduled to take place in the second half of 2018. The updated resource is established for the oxide profile of the deposit, from surface to a depth ranging between 20 and 50 meters, with an average thickness of 32 meters. The mineralization continues at depth within the fresh rock material, but drilling is stopped once fresh rock is reached. The area for the resources covers approximately 33% of the deposit's 3.2-square-kilometer surface area. The estimate was prepared using a block model constrained with 3D wireframes of the principal mineralized domains. Values for graphitic carbon were interpolated using Ordinary Kriging (OK) interpolation methodologies on 10 × 10 × 2m blocks. As in the previous resource estimate, a preliminary open pit optimization algorithm was run on the estimated grade block model. Only mineralization contained within the preliminary pit shell has been included in the resource estimate. The base case mineral resource estimate is summarized in the following table at a cut-off grade of 3.0% Cg together with estimate sensitivities at 1.64% Cg and 5.0% Cg. CIM definitions (May 10, 2014) observed for classification of mineral resources. Block bulk density interpolated from specific gravity measurements taken from core samples. Resources are constrained by a Lersch Grossman (LG) optimized pit shell using MineSight software. Pit shell defined using 30-degree pit slope, $1,300/t of concentrate (94.6% Cg grade, 79.25% Cg plant recovery), $2.00/t mining costs, $10.00/t processing costs, and $3.50/t G&A and $175/t of concentrate for transportation costs. Mineral resources are not mineral reserves and have no demonstrated economic viability. The estimate of mineral resources may be materially affected by mining, processing, metallurgical, infrastructure, economic, marketing, legal, environmental, social and governmental factors ("Modifying Factors"). Effective Date of Resource estimate is June 14th, 2018. Dr. Marc-Antoine Audet, P.Geo., Lead Geologist, SRG was responsible for estimating the mineral resources and has reviewed and approved the contents of this press release. Dr. Audet is a non-independent Qualified Person ("QP") within the meaning of NI 43-101 – Standards of Disclosure for Mineral Projects of the Canadian Securities Administrators. Under subsection 5.3(1) paragraph (c), as the mineral resources have changed by less than 100% from the previous filing, an independent QP is not required for the filing of this mineral resource update. SRG is a Canadian-based company focused on developing the Lola graphite deposit and the Gogota nickel-cobalt deposit, both located in the Republic of Guinea, West Africa. SRG is committed to operating in a socially, environmentally and ethically responsible manner. For additional information, please visit SRG's website at www.srggraphite.com. This press release contains "forward-looking information" within the meaning of Canadian securities legislation. All information contained herein that is not clearly historical in nature may constitute forward-looking information, including references to the plans and project of the Company such as proceeding with production at the Company's Lola Project, proceeding with exploration activities on its permits including Lola and Gogota. Generally, such forward-looking information can be identified by the use of forward-looking terminology such as "potential", "high-potential", "expected", "optimistic", "looking forward", "moving forward", or variations of such words and phrases or state that certain actions, events or results "may", "could", "would" or "might". Forward-looking information is subject to known and unknown risks, uncertainties and other factors that may cause the actual results, level of activity, performance or achievements of the Company to be materially different from those expressed or implied by such forward-looking information, including but not limited to: (i) volatile stock price; (ii) the general global markets and economic conditions; (iii) the possibility of write-downs and impairments; (iv) the risk associated with exploration, development and operations of mineral deposits; (v) the risk associated with establishing title to mineral properties and assets; (vi) fluctuations in commodity prices; (vii) the risks associated with uninsurable risks arising during the course of exploration, development and production; (viii) competition faced by the issuer in securing purchasers, off-taker markets, clients and experienced personnel and financing; (ix) access to adequate infrastructure to support mining, processing, development and exploration activities; * the risks associated with changes in the mining regulatory regime governing the issuer; (xi) the risks associated with the various environmental regulations the issuer is subject to; (xii) risks related to regulatory and permitting delays; (xiii) risks related to potential conflicts of interest; (xiv) the reliance on key personnel; (xv) liquidity risks; (xvi) the risk of litigation; and (xvii) risk management. Forward-looking information is based on assumptions management believes to be reasonable at the time such statements are made, including but not limited to, continued exploration activities, no material adverse change in metal prices, exploration and development plans to proceed in accordance with plans and such plans to achieve their stated expected outcomes, receipt of required regulatory approval, and such other assumptions and factors as set out herein. Although the Company has attempted to identify important factors that could cause actual results to differ materially from those contained in the forward-looking information, there may be other factors that cause results not to be as anticipated, estimated or intended. There can be no assurance that such forward-looking information will prove to be accurate, as actual results and future events could differ materially from those anticipated in such forward-looking information. Such forward-looking information has been provided for the purpose of assisting investors in understanding the Company's business, operations and exploration plans and may not be appropriate for other purposes. Accordingly, readers should not place undue reliance on forward-looking information. Forward-looking information is given as of the date of this press release, and the Company does not undertake to update such forward-looking information except in accordance with applicable securities laws.